For those of us lucky to be working on the bleeding edge of tech, we get to work on some of the coolest problems in automation, artificial intelligence, robotics, and virtual and augmented reality. We are driven to innovate not just because they are cool problems but because we believe what we invent makes life better for everyone. Technology like self driving cars, robot driven assembly lines, image classification, speech recognition and translation all have the promise to make our lives better. The hope of any enriching technology is that it frees our time to pursue a richer life. 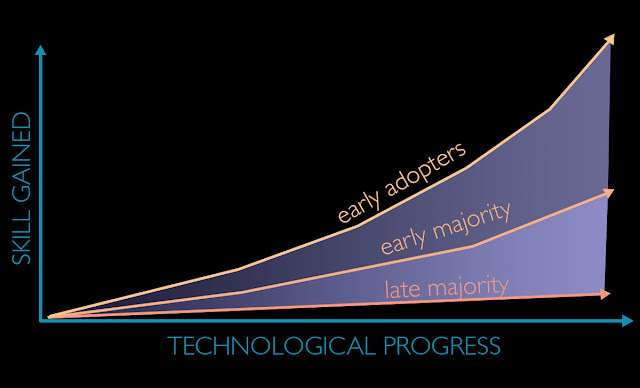 But if that is our goal, we need to be mindful of the skill gap we are creating between those who are early adopters of new technology and those who adopt later. And this gap could actually be doing more harm than good. A lot of people contribute to society by taxiing passengers, working on a factory floor, labeling and sorting information, and translating foreign languages - skills that are being made obsolete by those same futuristic technologies we work on. As tech continues to get better we may invent ourselves out of usefulness. Considering how hard it is to learn new skills to catch up on an accelerating wo, technological progress will lead towards a bankruptcy of purpose. If not addressed, this bankruptcy can have dire consequences on progress. I believe we are already seeing signs of problems with the dramatic shifts in world politics away from science backed thinking and towards populism, nationalism and a fear of reasoning. This is probably why messaging of climate change is still not getting through. Progress is the right path forward, but is there a way we can also solve the problem of the growing skill gap? This is where I think virtual reality may be able to help. My favorite feature of VR is how it has created the most intuitive interface for how we interact with computers. Up until now, our interaction has been a difficult abstraction through mouse clicks and keyboard strokes. With VR, I see new users pick it up within seconds. We've all grown up knowing how to move, look around, reach out to touch and grab things; VR just taps into those instincts. We can convey so much complexity with the ease of natural gesturing and soak up so much information through the ease of immersion. It's my belief that we'll be able to take advantage of this facility by creating educational VR experiences that will make it much easier to learn new, relevant skills. Unfortunately, making virtual content also suffers from a skill gap. Those who know how to create in this new space are mostly game makers who are passionate about making games. Those who are passionate about education technology are still learning the skills to create useful virtual experiences. That's why it should be an important goal for this new industry to make it easier to be a content developer. Heavily documented and community backed game engines like Unity and the Unreal Engine are a good start but are still designed around making games. We need the next generation of VR developer tools to make it easier for educators to get involved. The progress of technology is inevitable, but we need to remember that technology should also be used to close the skill gap it creates. And it starts by closing the skill gap with the tools we use to teach.